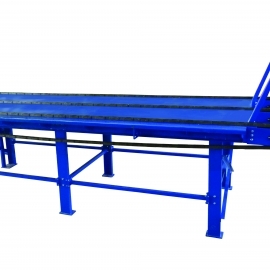 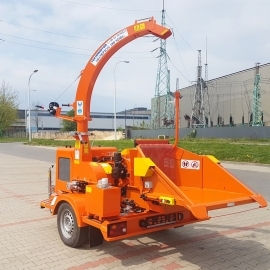 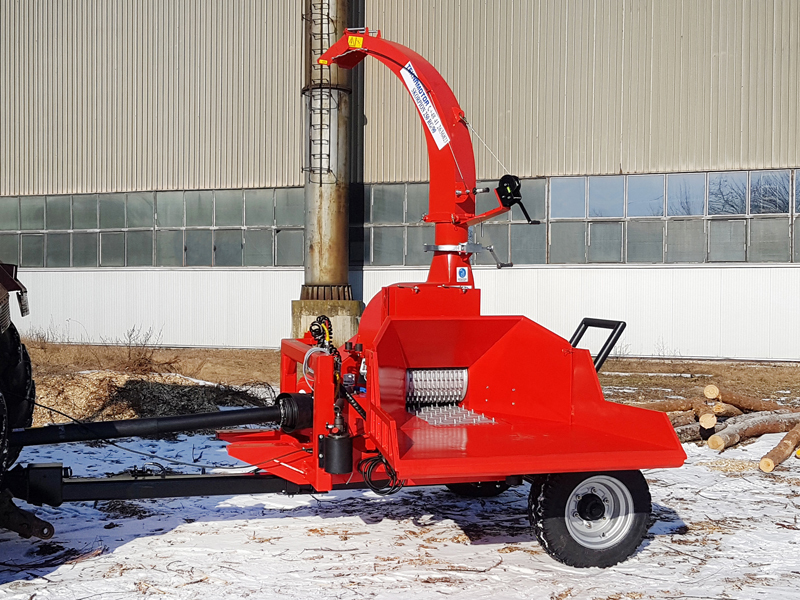 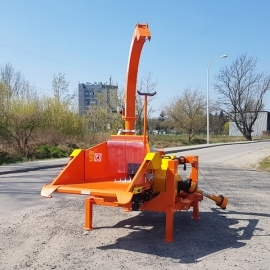 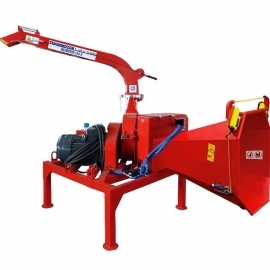 Skorpion 250 RG/90 with crawler chain conveyor has been designed for shredding tree limbs and trunks/stubs with diameter of 250 mm. 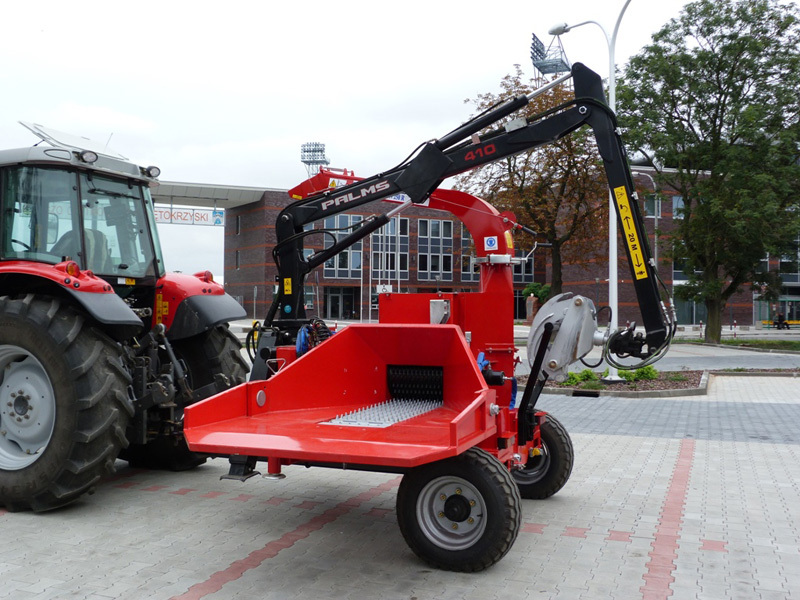 It’s a mobile disc model with pneumatic blow-out system installed on the disc. 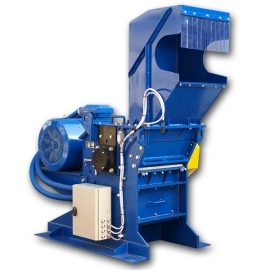 Chips are ejected through a rotary chimney which can turn by 360° in relation to the chassis. 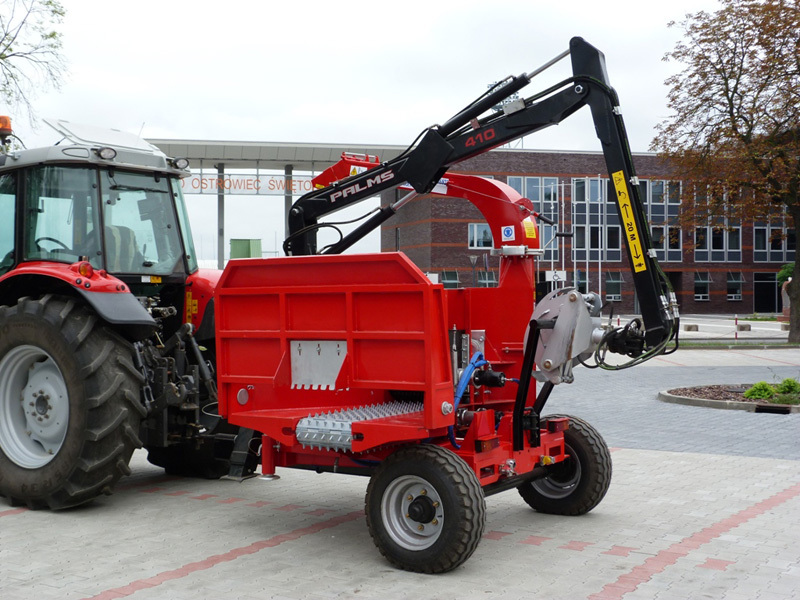 The machine to collaborate with over 100 hp farm tractor. 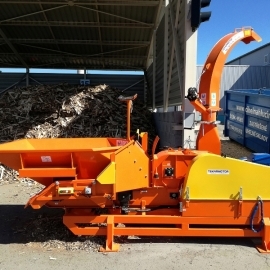 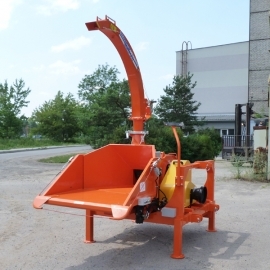 The cutting system of this chipper consists of a disc with cutting knives suitable for sharpening on either side. 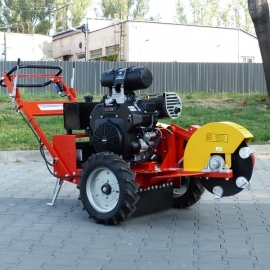 The drive is transmitted from PTO shaft of a tractor with the speed of 540 or 1000 revolutions per minute. 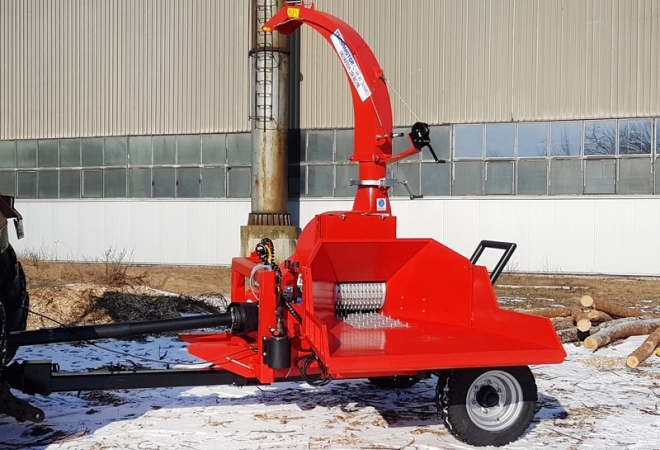 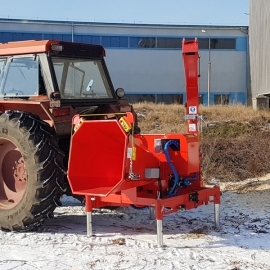 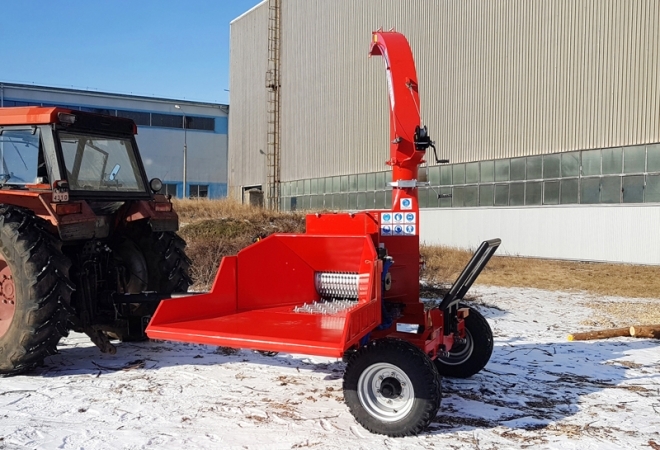 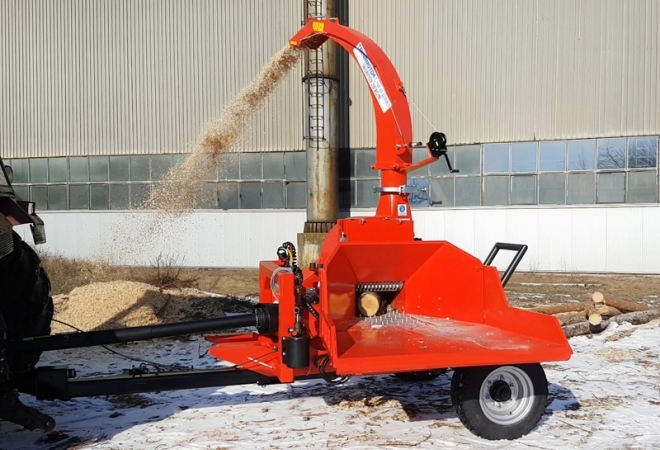 The essential equipment of the chipper includes a hydraulic propulsion system servicing the upper feeding roll and a crawler installed instead of normally used lower roll. 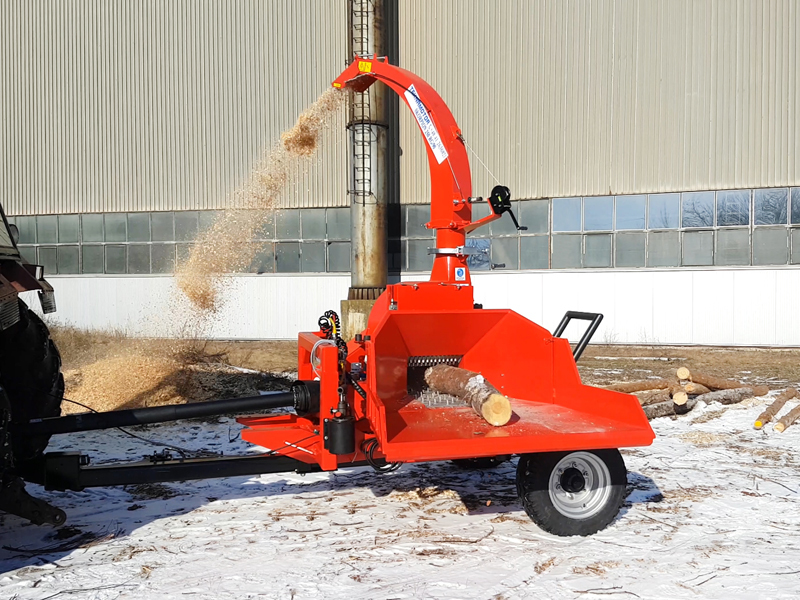 Such solution allows for easier loading of wood, improves operator’s work and enhances efficiency. 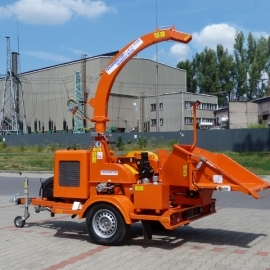 Both of them are driven by hydraulic motors. 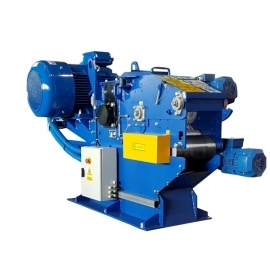 All above mentioned devices are driven by its own hydraulic pump. 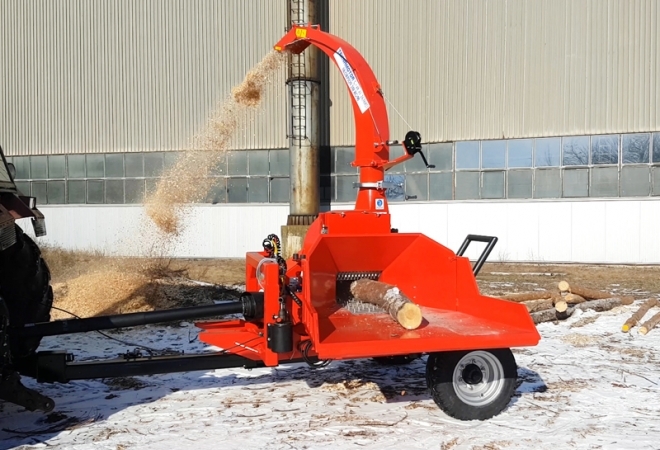 The construction of the chipper is set on a single axial chassis that enables the device to be towed behind a tractor on forest and field roads. 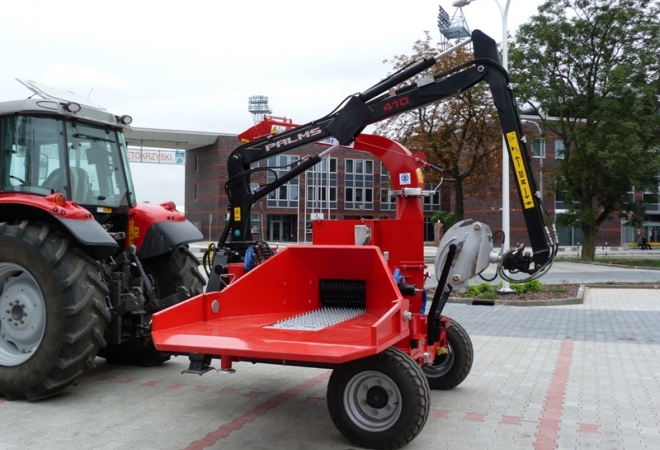 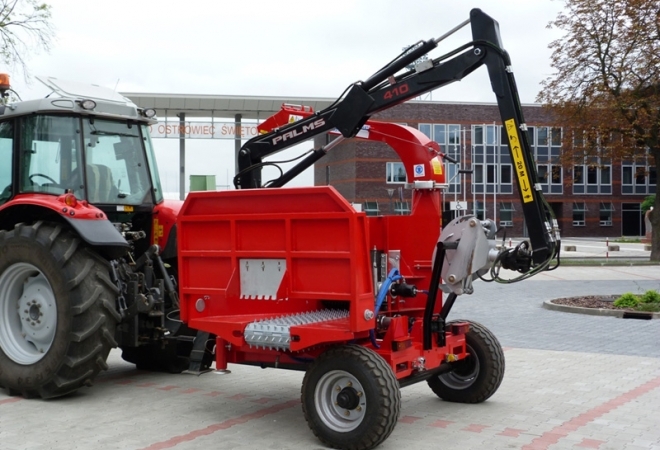 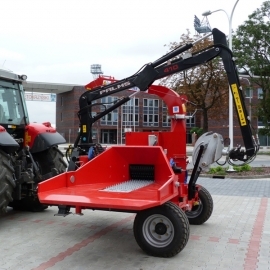 Innovative solution of the lateral position of the feeding table enables simultaneous transport of chipper and trailer with a tractor. 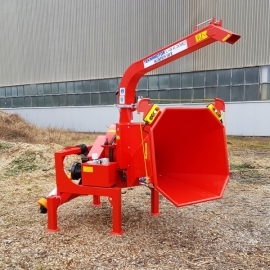 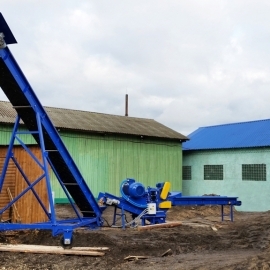 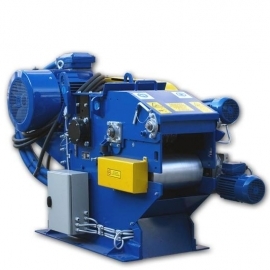 Due to large size of the material to be chipped, the machine can be equipped with a hydraulic mounted crane. 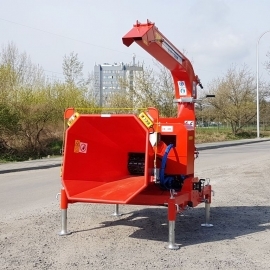 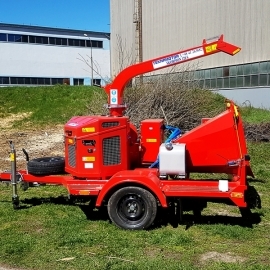 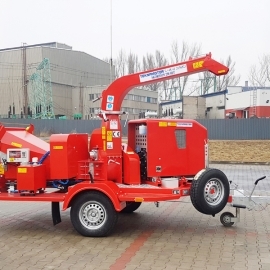 As a standard, the chipper is also additionally equipped with one of the most advanced electronic system of work control available on European market automatically protecting the propulsion system of the machine against overload/excessive duty through temporary stopping the feeding unit. 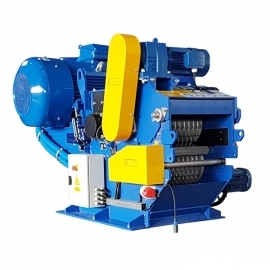 Easily editable software of the No-stress system provides a simple way to change the settings of the machine adapting it to individual needs. 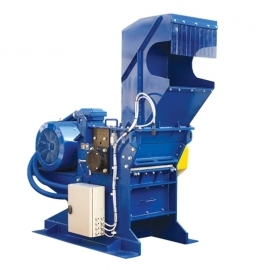 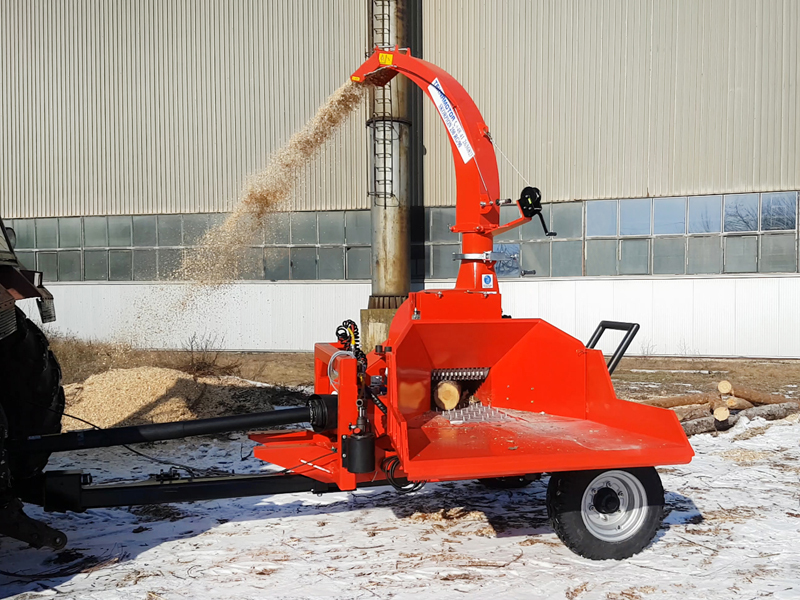 Preset "thick wood" and "thin wood" modes allow fast and easy change of the operation of the chipper in order to match the current material to be shred and increase the effectiveness of work. 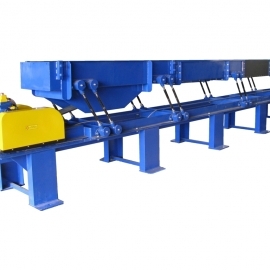 Total- and daily- hour meter is built into this system. 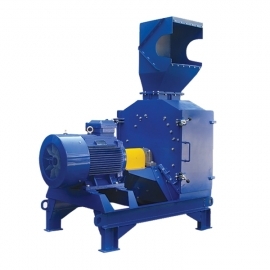 Chips made by Skorpion 250 RG/90 can be used as a solid fuel for heating in buildings (burning in ovens/stoves), as raw material to produce compost, for decorative purposes in gardens, parks, etc., and after additional disintegrating in a mill for production of pellets and briquettes. 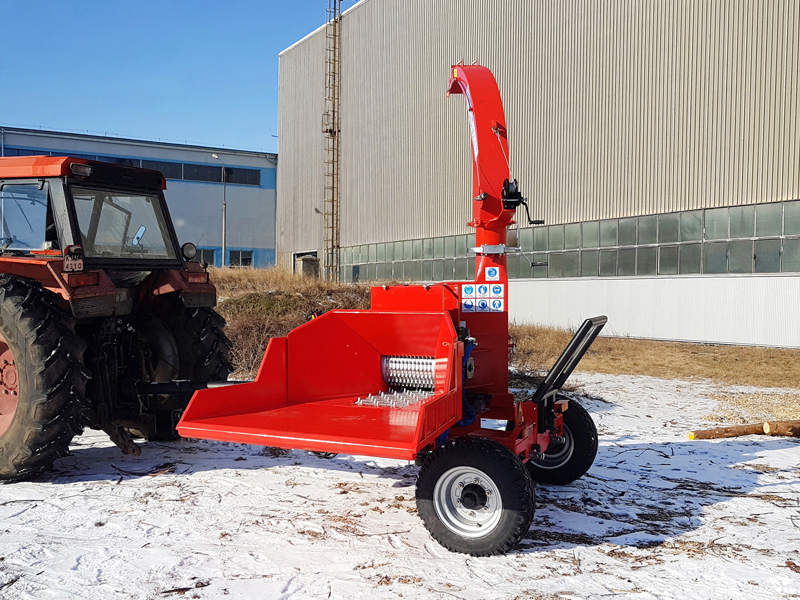 Axial chassis up to 25 km/h. 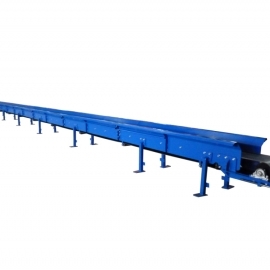 Swivelled by360° ejection tube with deflector. 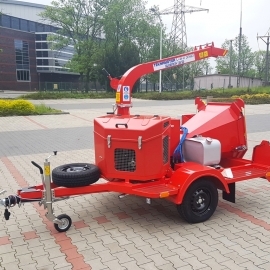 Sprung axle or air-type suspension equipped with air brakes. 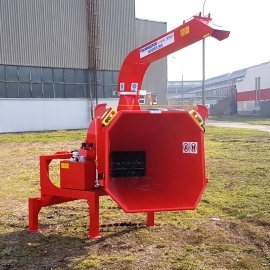 Hydraulically foldable ejection tube with automatic control of swivel by 240 ° and deflector.